As the Great Recession ended, 61 key cities across America -- the most populous one in each state plus all others with more than 500,000 people -- emerged with a gap of more than $217 billion between what they had promised their workers in pensions and retiree health care and what they had saved to pay that bill. While states have a much larger shortfall, cities face the same daunting challenges posed by unfunded liabilities for their public sector retirement benefits. For pensions, these cities had a shortfall of $99 billion in fiscal year 2009, the most recent year with complete data. The gap continued to widen in fiscal year 2010 as reflected by complete data for 40 of the cities, which saw unfunded pension liabilities rise by another 15 percent. Besides pensions, many localities also have promised health care, life insurance, and other non-pension benefits to their retirees, but few have started saving to cover these long-term costs. These unfunded liabilities loom even larger than for pensions (see graphic). As of fiscal year 2009, the cities in this report had promised at least $118 billion more than they had in hand to cover retiree health care benefits. Wide disparities exist in how prepared cities are to fulfill their pension obligations. Milwaukee and Washington, D.C., had surpluses at the end of fiscal year 2009, with enough money to cover 113 percent and 104 percent, respectively, of their liabilities, better than the best-funded state, New York, at 101 percent. In four cities -- Charleston; Omaha; Portland, Oregon; and Providence, Rhode Island -- pension systems were more poorly funded than those in Illinois, which at 51 percent was the lowest-funded state. Charleston trailed all the other cities at 24 percent. Overall, the cities had enough money to cover 74 percent of their pension obligations in fiscal year 2009, compared with 78 percent for states. 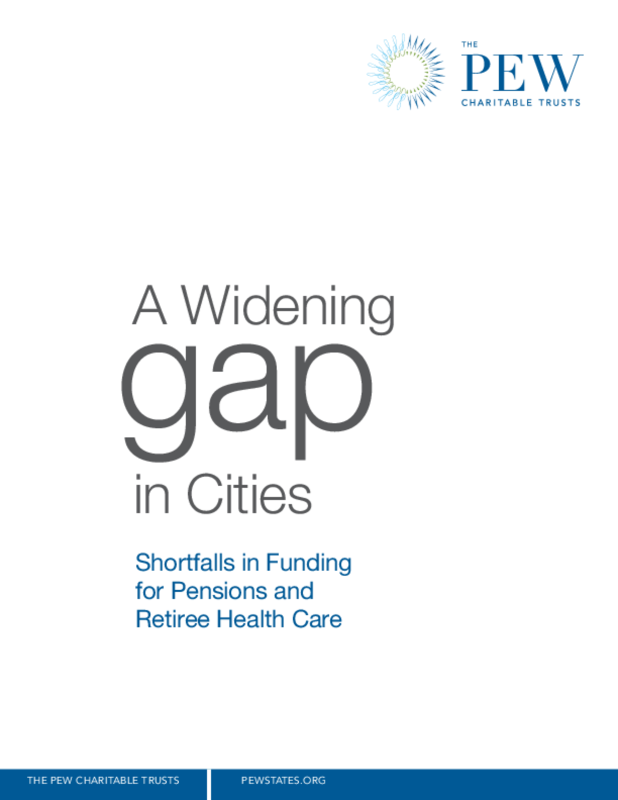 Cities have more in common when it comes to gaps in funding for retiree health care and other non-pension benefits. As of fiscal year 2009, overall, cities had set aside enough money to cover just 6 percent of their promises, compared with slightly more than 5 percent in states. Only Los Angeles and Denver had even half of the money needed. Copyright 2013 The Pew Charitable Trusts. All Rights Reserved.